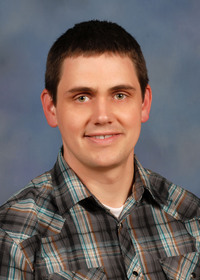 The information presented on this page was originally released on February 25, 2013. It may not be outdated, but please search our site for more current information. If you plan to quote or reference this information in a publication, please check with the Extension specialist or author before proceeding. I think all gardeners love to see butterflies visit their gardens in the summer months. If you want more butterflies this year, start planning now what to plant this spring to attract them. I want to tell you about two of my favorite plants that are guaranteed to attract these garden visitors. 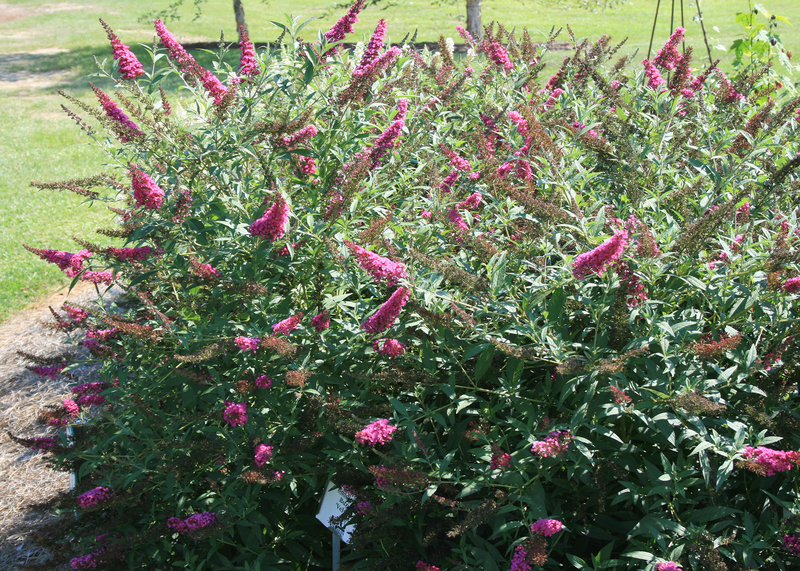 Butterfly bush has a loose growing habit that should never be contained by pruning. The flowers are sweetly fragrant clusters of tiny blooms that come in various shades of white, blue, purple, pink, red and even yellow. Flowers are displayed on arching, graceful stems. Butterflies and hummingbirds love these flowers. Plant butterfly bushes in the full sun for best flowering. Shade will reduce their flowering, and the plant will become thin and leggy. Butterfly bushes can handle hot, dry weather, but water them deeply a couple of times a month during drought conditions. Butterfly bushes tolerate any soil type as long as it’s well drained, but they grow best in a slightly alkaline soil. If the soil pH is below 7.0, apply a couple of handfuls of dolomite to the soil when planting. Fertilize sparingly as overfertilization can reduce the plant’s winter hardiness. Some new varieties on the market include the Flutterby and Buzz series, which are available in several colors. Treat Butterfly bush like a flowering perennial. When new shoots start to appear in the spring, prune last year’s growth back to about 6 inches from the ground. This encourages new growth and allows the flowers to bloom on new wood. Deadheading helps side shoots develop larger flower heads. 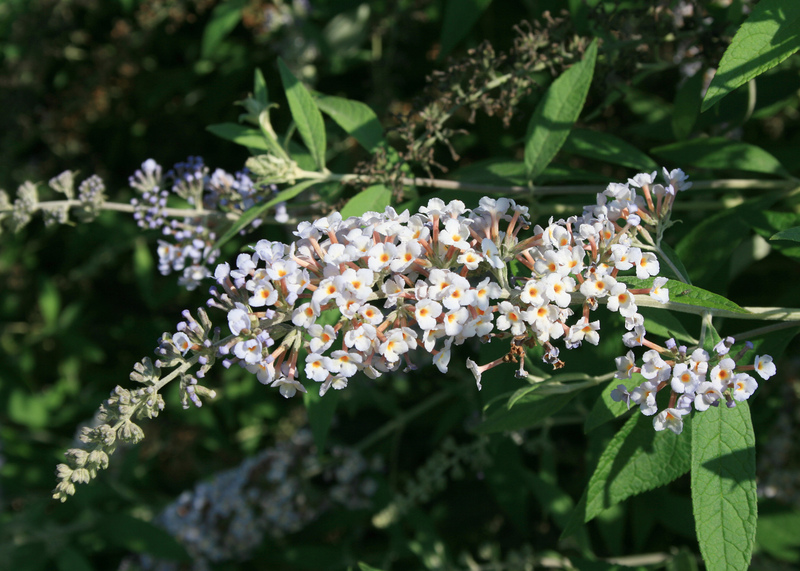 Butterfly bush has few pests, but it may get spider mites. Use the hose to give the foliage a hard spray to discourage the pests. Butterfly bushes are beautiful and easy to grow. They take hot and dry weather in stride and keep the butterflies coming to your garden. The other surefire butterfly magnet is butterfly weed. Butterfly weed is a common sight along interstates and highways during the late summer. The deep orange flowers stand out on cut embankments as a testament to the plant’s low maintenance requirements. 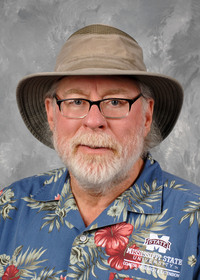 This plant was named the Mississippi Medallion Native Plant winner for 2012, and it deserves a place in your garden. Butterfly weed grows up to 36 inches tall and 24 inches wide with an upright, clumping growth habit. The clusters of tubular flowers are various shades of orange, and some are shaded towards yellow or red. Remove seed pods after blooms have faded to reduce reseeding. Seed pods removed and dried just before opening make a good material for dried arrangements. 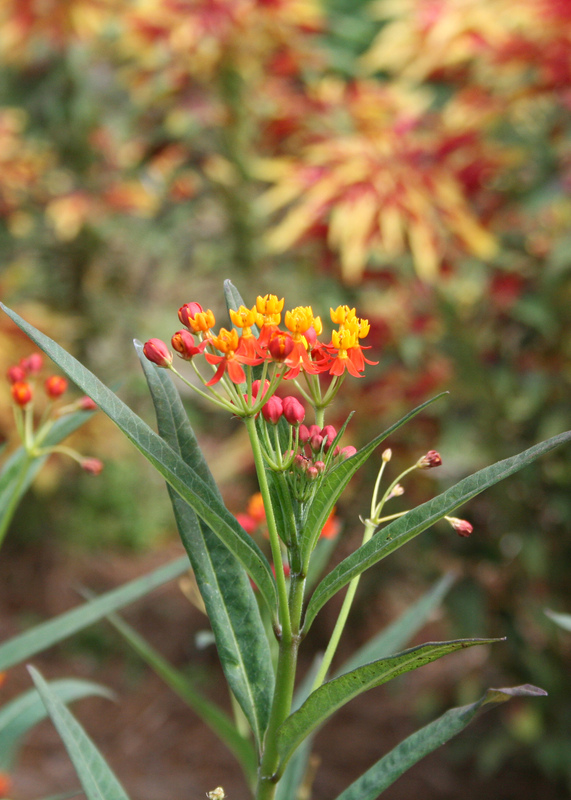 Butterfly weed can grow anywhere in Mississippi with good drainage. While this plant does not like to have wet feet, its close relative the swamp milkweed likes it wet. Swamp milkweed has red, pink and white flowers. Several years ago, I had a swamp milkweed that was covered with literally hundreds of Monarch caterpillars. Cocoons attached to everything, but I didn’t watch it close enough. One day I came out to find all of the cocoons empty. Can you believe I didn’t see a single butterfly emerge? For a dynamic color contrast, plant the orange-flowered butterfly weed with the bluish-purple globe thistle and the blue haze of Russian sage.